Two brand new furnished studio apartments available for rent in a 'ski in ski out' location at the foot of the slopes. Both apartments benefit from a south facing balcony in front of the stunning peak of the "Aiguille Rouge”. 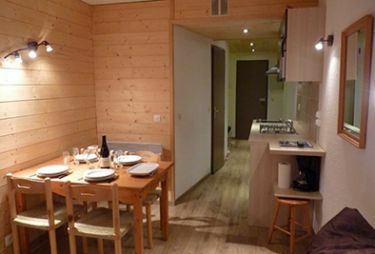 The accommodation is close to all shops and restaurants, and near the ESF ski school so no need to have a car. Arc 2000 is located in the middle of the Paradiski Les Arcs-La Plagne, one of the largest ski areas in Europe, with over 435km of ski runs for all levels. Easy to get to, you can get a transfer from Geneva airport to Les Arcs, or if you prefer you can take the bus from Geneva to Les Arcs. See our frequently asked questions page, or find the Les Arcs bus timetable here. Our ski hire shop, Les Arcs lift pass office, ski schools, shops and restaurants are all within walking distance of the accommodation, everything you need in a snow-sure ski in ski out location.